A new Southwest Research Institute study tackles one of the greatest mysteries about Titan, one of Saturn's moons: the origin of its thick, nitrogen-rich atmosphere. The study posits that one key to Titan's mysterious atmosphere is the "cooking" of organic material in the moon's interior. "Titan is a very interesting moon because it has this very thick atmosphere, which makes it unique among moons in our solar system," said Dr. Kelly Miller, research scientist in SwRI's Space Science and Engineering Division and lead author of the study. "It is also the only body in the solar system, other than Earth, that has large quantities of liquid on the surface. Titan, however, has liquid hydrocarbons instead of water. A lot of organic chemistry is no doubt happening on Titan, so it's an undeniable source of curiosity." The atmosphere of Saturn's largest moon is extremely dense, even thicker than Earth's atmosphere, and is comprised mainly of nitrogen gas. "Because Titan is the only moon in our solar system with a substantial atmosphere, scientists have wondered for a long time what its source was," she said. "The main theory has been that ammonia ice from comets was converted, by impacts or photochemistry, into nitrogen to form Titan's atmosphere. While that may still be an important process, it neglects the effects of what we now know is a very substantial portion of comets: complex organic material." Another odd aspect of Titan's atmosphere is that it's also about 5 percent methane, which reacts quickly (by astrophysical standards) to form organics that gradually fall to the surface. As a result, the atmospheric methane would either have to be replenished somehow or this current period of time is simply a unique era for Titan. Miller's investigation was spurred by data from the Rosetta spacecraft, a European Space Agency probe that studied the distant comet 67P/Churyumov-Gerasimenko with NASA participation and delivered the surprising discovery that the comet was roughly half ice, a quarter rock and a quarter organic material. "Comets and primitive bodies in the outer solar system are really interesting because they're thought to be leftover building blocks of the solar system," she said. "Those small bodies could be incorporated into larger bodies, like Titan, and the dense, organic-rich rocky material could be found in its core." To study the Titan mystery, Miller combined existing data from organic material found in meteorites with previous thermal models of the moon's interior to see how much gaseous material could be produced and whether it was comparable to the atmosphere now. 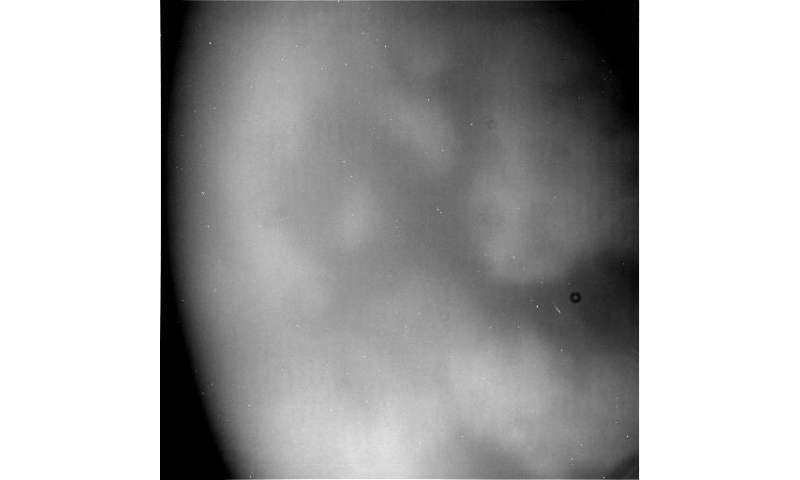 Following the standard rule of, "If you cook something, it will produce gases," Miller found that approximately half of the nitrogen atmosphere, and potentially all of the methane, could result from the "cooking" of these organics that were incorporated into Titan at its very beginning. Miller's study will appear online in The Astrophysical Journal on January 22. I think it is interesting that Titan has an atmosphere thicker than the Earth's. Considering the discrepancy in Mass. Any possibility, that the conditions resulting in such an atmosphere are NOT unique to local conditions? Leaves open the possibility that a potentially useful moon such as Callisto, could have an Earth-type atmosphere introduced? Maybe LIFE on Titan! No one who wnats to keep his cushy college job will say that even though many must believe exactly that. The researchers are grasping at straws. They have absolutely no idea where the nitrogen OR methane on Titan comes/came from so they have to resort to the usual blubber about comets. If methane was indigenous on Titan then it simply defies any notion of billions of years of existence. If not, then where did it come from? Furthermore, since the methane is being converted to ethane there should be oceans of ethane if methane originated on Titan and lasted for billions of years. But there isn't. Hence grasping at comets. Which in themselves are a serious indictment of the assumption of billions of years for the solar system. Comets disappear too fast and over billions of years there should be none left. Hence the grasp at the Kuiper belt (no go there) and Oord cloud (doesn't seem to exist at all) as sources. The one clean and simple solution cannot be countenanced: Titan is not even millions of years old. A prior commitment to Ga. (for evolution) prevents that. freddy... wow! You have a real commitment to blathering nonsense. Nome of the treatments for your Tourettes is working? I realize that you are only a yecbot bent sinister to disrupt this site. But I am curious. You mentioned Ga. Did you mean the nation or the state? Cause Frankly & Ernestly, I have no real enthusiasm for making a commitment to either locality. In case you were wondering about the methane stench of Titan? I took it upon myself to make inquiries. Receiving a revelation, that the infant deity has been using it as a convenient potty for the last 14 billion years. The little tyke still hasn't learned to flush! I think it is interesting that Titan has an atmosphere thicker than the Earth's. Considering the discrepancy in Mass. Any possibility, that the conditions resulting in such an atmosphere are NOT unique to local conditions? Temp. is far more a decider than mass re atmospheres. Mercury has 2x the mass of Titan and no atmosphere because of the high temp. means gas molecules are moving too fast for Mercury to hold on to them. At Titan's distance, the molecules of most gasses are moving so slowly that with just 1/3 of Mercury's gravity Titan can hold on to them. The moons of Jupiter at the same distance as Titan would sport thick atmospheres too. If Titan were moved to the same Orbit as Earth over millions of years, it'd lose all its atmosphere and 1/2 of its mass as the ice crust and mantel would boil away. If Earth were at the same distance as Titan it's atmosphere would slowly grow to the size of Neptune or larger over time. Thanks Jon for the info. Where it is in the over all Solar System. Proximity to the resources of the Main Asteroid Belt, the Trojan clusters & Titan. & it's location orbiting Jupiter. If the best we can do is robot exploration & economic exploitation of beyond the Earth? Then Callisto's lack of an atmosphere would be advantageous from a manufacturing standpoint. If we can resolve the twin dilemmas of biology being able to adapt to zero-to-micro-gravity conditions. Enough to reproduce over multiple generations. & either discover a huge amount of gold in the asteroids. Enough to sheild numerous habitats & manned vessels? Or invent a device able to reliably generate a protective shield against hard-radiation. Or both. What if the shield power source fails or other mechanical failure or disruptive influence? Plus, you could sell EFT rights to the gold-foil around your habitat. At hundreds of millions of miles away? Whose going to steal it? Callisto's orbit of Jupiter is almost twice that of Titan's orbit of Saturn. This places Callisto outside the worst of Jupiter's generated EM field. If Human's can survive away from Earth, for sustained periods of time? With minimal health risks? & we can install a breathable atmosphere for Callisto? I'd betcha Callisto becomes a prime resort & honeymoon destination! Oh Man! Imagine looking up in that sky watching Jupiter Rise. With your honey in your arms!? !